The Gypsy Moth Summer in Poets & Writers “Page One”: Where New & Noteworthy Books Begin. The Gypsy Moth Summer gets a second printing! After a busy three weeks since publication (15 events in 8 states), some exciting news! I am so grateful to every one of you–readers, booksellers, reviewers, interviewers, book bloggers, series organizers, fellow authors and friends–who made this possible. 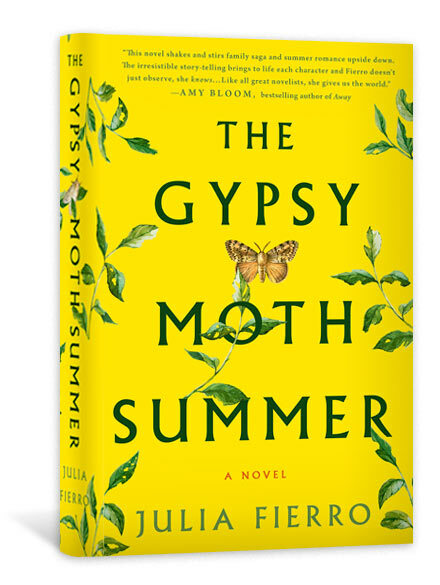 “The (gypsy moth) infestation is the perfect backdrop for a story that is complex, relevant and a delight to read. Racism, classism, bigotry, abortion, domestic abuse, business ethics (or lack thereof), terminal illness, marital strife – it might sound like too much but it turns out to be just enough and this novel ultimately becomes one about the power those we love and trust have to destroy us, slowly at first and then in unstoppable waves (like a biblical plague) but also the restorative, strengthening power of love meant to last. The world is full of both kinds and, Fierro’s writing suggests, you’ll never quite know until you’re in the thick of it which kind of love you’ve got. But don’t stop loving, even with the threats. There’s beauty in everything.” READ MORE. Cutting Teeth, by Julia Fierro (St. Martin’s). Five pairs of variously overmedicated and undersatisfied Brooklyn parents head to a Long Island beach house for Labor Day weekend with their cranky, drooling, pampered progeny. What could possibly go wrong? In this comically energetic début novel, Fierro, a mother of two who runs a writing workshop in Brooklyn, examines how easily privilege, neurosis, and love freighted with overwhelming fear of failure can turn even the sanest women into “sancti-mommies.” As her characters struggle to tame their toddlers without becoming fractious children themselves, Fierro reminds us how complicated the task of rearing human beings is, even in the most liberal of enclaves. CUTTING TEETH is Oprah.com’s Book of the Week and receives a wonderful review! A wonderful review of Cutting Teeth in The Boston Globe.